Since independence in 1991, Kazakhstan’s ‘southern capital’, Almaty, has engaged in fairly extensive efforts at ‘Kazakhising’ local toponyms. Now the central arteries of the city, once part of the old Soviet planimetry, display ‘genuinely’ Kazakh names. Streets once bearing the names of Bolshevik icons like Kalinin and Kirov are now named after legendary heroes (Kabanbai Batyr) or other figures from Kazakhstan’s nomadic past (Bogenbai Batyr). Surprisingly, however, the street named after Bolshevik writer Dmitry Furmanov has retained its original Soviet name. The local rumour is that the ‘Kazakhization’ of Furmanova ulitsa has been put on hold until the passing of Nursultan A. Nazarbayev, when this leafy street in Almaty will be renamed after the first President of post-Soviet Kazakhstan. The example of Furmanova ulitsa offers a fitting metaphor to describe the sense of political stagnation that pervades today’s Kazakhstan. A sense that much-needed change has been postponed until the inevitable, though not yet imminent, leadership change. Externally, the Kazakhstani government continues to promote its image of internal dynamism and international leadership. Success in obtaining the rotating chairmanships of prestigious multinational organisations such as the Organisation of Islamic Cooperation and OSCE is treated as an indicator of Kazakhstan’s international vitality. Data on GDP growth and economic vigour are often offered in support of this narrative. However, when the situation is observed internally, it seems that Kazakhstan’s politico-economic evolution has definitely entered an intermediate stage, in which the (authoritarian) impetus of the 1990s and the 2000s has been replaced by the immobility typical of the end of an era. Virtually every political conversation going on in the country touches sooner or later on the critical issue of what will happen when Nazarbayev leaves power. And debates on the President’s (political and biological) longevity are usually accompanied by speculations on the existence of potential arrangements for a pre-determined succession. It was through this very prism that commentators analysed the reshuffle of late September 2012, when outgoing Prime Minister Karim Masimov was appointed to run the Presidential Administration. Similarly, in December 2011, the dismissal of Timur Kulibayev (one of Nazarbayev’s sons-in-law) from the chairmanship of Samruk-Kazyna, Kazakhstan’s sovereign fund, stimulated much debate about the importance of family connections for the presidential succession. In Kazakhstan, as in the rest of post-Soviet Central Asia, power can be considered as the function of one’s proximity to the President. Masimov’s career trajectory can thus be regarded as a significant promotion, and Kulibayev’s marginalisation as a weakening of his power position. The country remains locked in all kinds of speculation, periodically reinforced by news of Nazarbayev’s failing health. All the while, political, economic and social decisions still have to be taken. and Kazakhstan’s foreign policy machinery still has to identify new ways to increase the regime’s international legitimacy. The junction that the Kazakhstani regime has entered is thus, in effect, a political cul-de-sac. For the moment, high oil prices continue to support the Kazakhstani economy and sustain record GDP growth, though there are no guarantees that will continue. 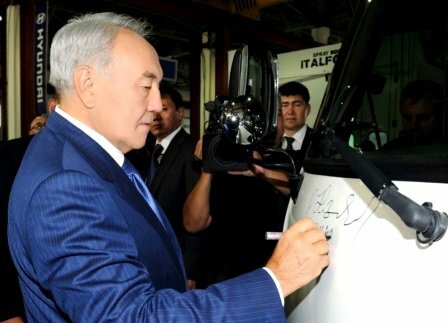 It is possible to identify the precise moment at which Kazakhstan entered this phase of possibly irreversible decline, and that is Nazarbayev’s decision to run in the snap presidential election of early 2011. By entering his third decade at the helm, Nazarbayev, who turned 72 last July, manifested his intention of remaining in power indefinitely. He thus established an invisible link between his mortality and the power position of the elite that supported him throughout the post-Soviet era. Two things mark the post-election landscape: the appearance of a more stable regime and the neutralisation of every form of internal opposition. The neutralisation happened quickly, and targeted both discontent within the elite, as with the radicalisation of society, which in the recent months had come to be viewed as even more dangerous. The ongoing struggle for labour rights in the Mangystau oblast [region] obviously represents the most visible aspect of the radicalisation of Kazakhstani politics. At the same time, a substantive part of the dissent has been channelled through more violent outbursts, which have been presented as conclusive evidence of Islamist resurgence in Kazakhstan. The country, in recent times, experienced its very first suicide bombing (Aktobe, July 2011), another deadly attack was carried out in Atyrau in late October 2011, while, on 12 November 2011, a more brutal attack claimed several lives in the southern city of Taraz. The Nazarbayev regime’s response was implacable: repression was adopted as the uniform reaction to these very different expressions of discontent. The state’s brutal response to the demonstrations of oil workers in Zhanaozen, and the draconian law on religious rights introduced in the aftermath of the 2011 attacks are hence two sides of the same coin. They reveal the struggling outlook of a stagnating regime that is no longer capable of effective policy-making and has resorted to classic authoritarian methods in its dealing with the wider population. This sense of decline is perfectly captured by the images coming from Zhanaozen, where, on the day in which the country was celebrating the 20th anniversary of independence (16 December 2011), Kazakhstani armed forces opened fire on citizens demonstrating in the street. There is, however, more than brutal repression and punishing legislation to the confrontational tendencies that have emerged in Kazakhstani politics. The 2011 wave of terrorist attacks allowed the government to capitalise increasingly on the population’s sense of insecurity. This consideration became crucially important in the stagnating panorama of post-2011 Kazakhstan, with the regime flagging up an ‘Islamist threat’ while outlining its plans for tighter security. This is a very different reaction from that of Uzbek President Islam Karimov to the events of 9/11: he embarked upon a similar campaign to increase the country’s international prestige. In Kazakhstan, however, the alleged resurgence of radical Islam has served Nazarbayev and his associates in their efforts to recuperate some of the internal legitimacy lost in Zhanaozen. As a consequence, more than half of the Kazakhstani mosques are now monitored through CCTV systems, the regime continues to show unease at foreign-trained religious leaders, and a fully-fledged scare campaign is underway (with media, especially radio, increasingly denouncing the oddities of Wahhabism and other extreme interpretations of the Islamic credo). While there is no conclusive evidence regarding the genuine radicalisation of Kazakhstani Islam, there can be virtually no doubt about the existence of a concerted scare campaign against Islam. An example might be useful here: immediately after the discovery of the bodies of 14 Kazakhstani border guards and one ranger in the Almaty oblast (May 2012), local sources attributed responsibility for the murder to a cell of Saudi Salafis aiming to sabotage the Kazakhstan-China relationship. Although the killing was later attributed to the homicidal outburst of another border guard, an aura of mystery still shrouds public perception of the event, which continues occasionally to be described as a manifestation of Islamic violence in Kazakhstan. The regime’s systematic refusal to engage in political dialogue with the opposition and its deliberate plans to marginalise any unsanctioned manifestation of Islamic sentiment have hence emerged as two pillars of the leadership’s domestic position. This intransigence, in all likelihood, will continue to characterise Kazakhstani governance until the end of the Nazarbayev era. Kazakhstan’s future outlook, in this sense, does not appear bright, as the rapid deterioration of whatever little internal dialogue had survived 20 years of fictitious liberalisation is now exacerbating the socio-political stagnation into which the regime slid in 2011. As in the case of Furmanova ulitsa, change for Kazakhstan is postponed to a later date.